Making books and teaching people how to make them is the main focus of my work. I find teaching very rewarding and derive great satisfaction from watching others make their own individual and personal books. I love experimenting and use many unorthodox methods to construct and decorate the books I make. I gain great pleasure from the fact that I have made the complete book. I recycle as many things as possible and start with very cheap and unpromising materials and strive to turn them into something of worth. Though I do use machine embroidery, mostly for practical reasons, to stitch background layers together or to work on outlines, it is hand stitching I love the most. Feeling the fabric and thread as I stitch connects me with my work more than any other process. I find, no matter how much I experiment, my work always ends up being a book. I work to commission, creating books tailored to my client's individual needs. These are costed on an individual basis. I have a small stock of books for sale - these start at around £450.00 each. Details can be obtained by sending me an email. In 2014 I worked with my husband Jim Wire to produce a 61 panel exhibition about life in the First World War in the villages of Charing and Charing Heath in Kent, UK. This exhibition, organised by the Charing and District Local History Society, was sponsored by the UK National Lottery Fund and a number of local authorities. I have published two books “Page After Page” (reprinted 2015), which was originally published in October 2009. “Under The Cover”, my second book, was published in August 2012. My work has been published in a number of textile magazines: "Cloth Paper Scissors", "Workbox", etc. as well as “LandScape” magazine and numerous online features. In 2018, my husband designed and produced a book called “Charing in the First World War” which was illustrated by me under my married name of Frances Wire. The book was based on the 2014 exhibition (see above) which we also designed, illustrated and produced in association with the Charing and District Local History Society. 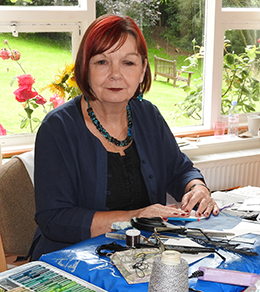 I taught: City & Guilds Embroidery Parts 1 and 2, Machine Embroidery, Machine Embroidery Distance Learning and Stitched Textile masterclasses in colleges for many years.